« Well… I guess this leaf will be just fine. The Minnesota Down Syndrome Association has become a very important organization to the Linkert family. They offer a number of resources for individuals with Down syndrome, and their families, including “Down Comforter” packets for new and expectant parents, parent groups, newsletter, social activities, and many other wonderful services. They have been truly instrumental in our entry into this unexpected pathway of our life, and we are very grateful for them. We are asking are friends and family to join in DSAM’s biggest fundraiser, the 2006 Buddy Walk. The Buddy Walk promotes awareness and advocacy for people with Down syndrome. Last year over 5000 people participated in Minnesota’s Buddy Walk. 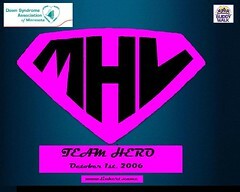 Janet and I, along with my parents and the Burfeinds, are taking part, and forming “Team Hero”. Our goal is to raise $250 for this fantastic organization. Please consider Maeve “Hero” Linkert, be a “buddy” and sponsor “Team Hero” in the Buddy Walk. This entry was posted on September 27, 2006 at 8:35 pm and is filed under Uncategorized. You can follow any responses to this entry through the RSS 2.0 feed. You can leave a response, or trackback from your own site. We are looking forward to this! Are we getting the T-Shirt through the walk or are we doing a T-Shirt on our own for ‘Team Hero’? I hope others will walk with us! 🙂 It will be fun! We would love others to join us in the walk as well. It’s going to be a great time!I think we should do our own t-shirt. Count me in! Let me know what I need to do. (twirl a baton, do summersults from Jon’s back, walk on stilts, . . .) Looking foward to it! how did the walk go? ?